In 2010, the City of Boston's Department of Transportation wanted to introduce planners, designers, engineers, and the wider public to an innovative new policy approach to urban street design known as Complete Streets. With the help of architecture and planning firm Utile, Inc. and transportation planning firm Toole Design Group, the city produced Boston Complete Streets Design Guidelines, a 200-page graphic compilation featuring emerging best practices in Complete Street policies, design recommendations, and an emphasis on how key stakeholders — citizens, developers, and public agencies — could support the newly adopted policy. Today, Boston Complete Streets Design Guidelines is a trusted resource for the city's urban design professionals. The guidelines also have been turned into a fully interactive website. The city set out to accomplish two goals with the Guidelines: spread knowledge about emerging best practices in urban street design, and build literacy of and support for these efforts among the wider public. With the help of fully imagined, detailed illustrations, Boston was successful in accomplishing both goals. The Guidelines also clearly articulate a multimodal travel experience, environmental sustainability, and advanced technologies as fundamental principles of the Boston Complete Streets program in manner that is comprehensible for audience unfamiliar with urban design. One of the greatest assets of the Boston Complete Streets Guidelines is its unique layout. 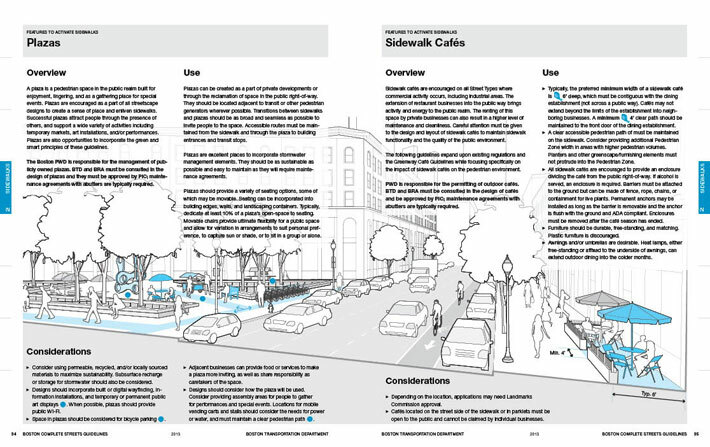 Unlike other metropolitan planning resources of its caliber, the Guidelines explain recommendations and best practices for implementation of Complete Streets policy through rich, multimedia imaging, including infographics and staged set illustrations. Each of the staged illustrations features a recognizable Boston icon, a technique used to help the graphically illustrated manual resonate with its audience. Beyond the context of each picture is a salient message that says Complete Streets enhances urban quality of living. The Guidelines were not exclusively created for print. An interactive website complete with the entire downloadable manual, a community outreach blog, and events calendar was launched simultaneously with the formal public announcement. The website has continued to see high levels of traffic in part because of the city's commitment to maintain clear and current content. 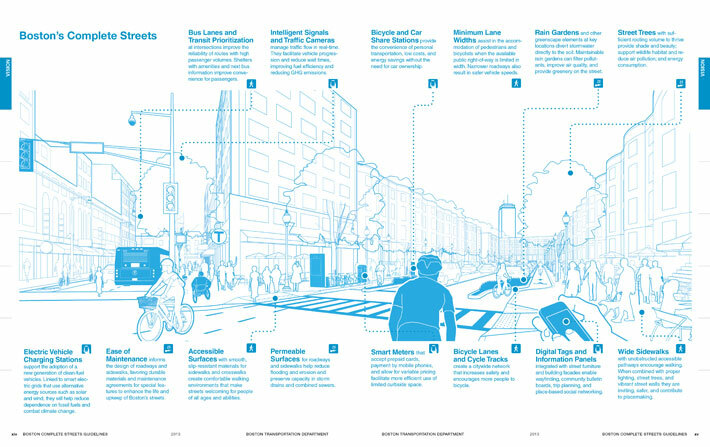 The Boston Complete Streets Guidelines set forth standards for the multimodal, green, and technologically advanced urban street of the future. This 'Vision Graphic' aims to educate the general public about the overarching principles of the program, and introduces an iconic graphic language that serves as the brand of the project. Since their inception, the Boston Complete Streets Design Guidelines have become the public face and effective outreach tool of a much wider array of urban renewal projects in Boston. Most recently, the Guidelines have been used as a model in reconstruction projects across the city, including Mt. Vernon Boulevard. Thanks to the unique nature of the Guidelines, the change in perception of roadways as "auto-centric" to "neighborhood connector" and beyond is now possible. The Guidelines contain both aspirational design principles and detailed dimensional guidelines. The result is both engaging to the general public and informative for design and engineering professionals.